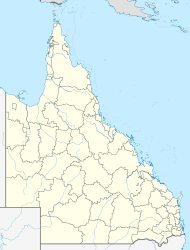 Ravenshoe (/ˈreɪvənz.hoʊ/ RAY-vənz-hoh) is a town and locality in the Tablelands Region, Queensland, Australia. At the 2011 census, the town of Ravenshoe had a population of 860. This figure refers to the immediate township area only. The locality has a population of 1,442. Ravenshoe is on the Atherton Tableland in Far North Queensland. It is located 123 kilometres (76 mi) south west of the regional centre, Cairns. At 930 metres (3,050 ft) above sea level, Ravenshoe is the highest town in Queensland, with Queensland's highest pub "The Ravenshoe Hotel" (formerly the Tully Falls Hotel until 2014) and highest railway station. It also has the Millstream Falls, the widest waterfall in Australia. Traditionally the main industry in Ravenshoe was timber, but since 1987, when the government made 900,000 hectares (2,200,000 acres) of surrounding rainforest world heritage listed, the main industries have been tourism, beef and dairy farming. The traditional owners of the land in the Ravenshoe district are the Jirrbal people who speak a dialect of the Dyirbal language. The site of the present day Ravenshoe was first settled by pastoralists prior to 1881 but when stands of red cedar (Toona ciliata) trees were found at nearby Cedar Creek, the mining entrepreneur, John Moffat purchased the pastoral properties in 1897. A village called Cedar Creek was established. By 1910, the nearby mining town of Herberton has been connected by railway to Cairns and Cedar Creek had been renamed Ravenshoe. The name is supposed to have been chosen because a copy of Henry Kingsley's novel Ravenshoe was found discarded nearby. By 1912, Ravenshoe had a store, a school, the Club Hotel and a population of 1,000 people. The timber industry was by now supplying Queensland maple (Flindersia brayleyana), oak (Argyrodendron peralatum) and black walnut (Endiandra globosa) but it was not until 11 December 1916 that Ravenshoe was finally connected with Cairns by the Tablelands railway line. Roads connected Ravenshoe with Atherton and Innisfail by 1936 and by 1949 there were three sawmills, two hotels, two cinemas, a guest house and two churches. In World War II as part of the Atherton Project, tent encampments were established by the Australian Army (6th and 7th Divisions) near Ravenshoe, Wondecla and Wongabel. The railway service from Atherton to Ravenshoe closed in 1988, following the designation of the Wet Tropics of Queensland as a UNESCO World Heritage Site. The Ravenshoe Library opened in 1992 and had a major refurbishment in 2017. Ravenshoe became national news after a vehicle ran into a gas cylinder at the Grigg Street 'Serves You Right Cafe' on 9 June 2015. In the resulting explosion and fire 20 people were hospitalised, 8 critically injured. Two people, the manager of the cafe and an 82-year-old Silver Valley resident, later died from their burns. As of 16 June 2015[update] there were still 7 people listed as critical with burn injuries. Five of them were females aged 43, 51, 59 and 75, and three males aged 56, 59 and 69. All were being treated in Brisbane, while the driver of the vehicle that caused the explosion, with a broken spine and burns, was also listed as critical and being treated in Cairns. Ravenshoe is located close to waterfalls, crater lakes, swamps, water holes, rainforests and historical landmarks. There is also a diverse variety of plants and animals, including 12 species of possum, 8 species of kangaroo and abundant bird life. In 2005, Malaan National Park was declared over forests which were previously known as Dirran State Forest. Misty Mountain Wilderness trails are a network of extensive walking tracks that traverse Tully Gorge National Park and Wooroonooran National Park. There are bushwalks to the Millstream Falls as well as Little Millstream Falls. From time to time, a steam train runs between Ravenshoe and the nearby town of Tumoulin, carrying locals and tourists to and from the local markets. Ravenshoe has a number of galleries and creative industries, reflecting the nature of the locals. The Windy Hill Wind Farm owned by Queensland Government's Transfield Services Infrastructure Fund (together with the Koombooloomba hydroelectric dam) generates enough electricity to power several towns. Ravenshoe has a butcher, bakery, an IGA supermarket, Cornetts Supermarket, two cafes, several craft shops, a Vinnies op-shop, a post office, a medical centre, a newsagency, a chemist, a video store, a Home hardware store, two pubs, two tyre shops, four fuel outlets, two caravan parks, a laundromat, Bendigo Bank and National Australia Bank branches, two real estate agencies and three schools - Ravenshoe State School (with primary school and high school campuses), St Teresa's Primary School and a community kindergarten. The Ravenshoe Millstream Country Club has a 9-hole golf course which is claimed to be the highest golf club in Queensland. Camping and caravan accommodation are available on site, for casual golfers. The Tablelands Regional Council operate a public library at 24 Moore Street. The Ravenshoe branch of the Queensland Country Women's Association meets at 15 Herbert Street. ^ Australian Bureau of Statistics (31 October 2012). "Ravenshoe (Urban Centre)". 2011 Census QuickStats. Retrieved 28 August 2014. ^ "Ravenshoe - town (entry 28067)". Queensland Place Names. Queensland Government. Retrieved 6 April 2017. ^ "Ravenshoe - locality (entry 48849)". Queensland Place Names. Queensland Government. Retrieved 6 April 2017. ^ a b Australian Bureau of Statistics (31 October 2012). "Ravenshoe (State Suburb)". 2011 Census QuickStats. Retrieved 16 June 2015. ^ "Publocation". Archived from the original on 8 February 2017. Retrieved 8 February 2017. ^ Dalton, Nick (31 May 2014). "Historic Hotel Tully Fally at Ravenshoe changes name after 87 years to reflect location". Cairns Post. Retrieved 10 February 2017. ^ a b c d "Ravenshoe". Centre for the Government of Queensland. Archived from the original on 11 June 2015. Retrieved 10 June 2015. ^ "Ravenshoe, Innot Hot Springs and Mt Garnet". Tropical Tablelands Tourism. Archived from the original on 11 June 2015. Retrieved 10 June 2015. ^ a b "Ravenshoe Visitors Centre". Ravenshoe Visitors Centre. Archived from the original on 14 June 2015. Retrieved 12 June 2015. ^ "The Australilan Army". Queensland WWII Historic Places. Queensland Government. 30 June 2014. Archived from the original on 7 February 2018. Retrieved 7 February 2018. ^ "The History of Ravenshoe Steam Railway 'Capella'". Ravenshoe Railway Company Ltd. Archived from the original on 6 April 2017. Retrieved 6 April 2017. ^ "Public Libraries Statistical Bulletin 2016-17" (PDF). Public Libraries Connect. State Library of Queensland. November 2017. p. 16. Archived (PDF) from the original on 30 January 2018. Retrieved 29 January 2018. ^ "Ravenshoe cafe explosion: Second person dies in Brisbane hospital from blast injuries". ABC News. Australian Broadcasting Corporation. 15 June 2015. Archived from the original on 15 June 2015. Retrieved 16 June 2015. ^ Purtell, Meg; and, staff (13 June 2015). "Ravenshoe cafe explosion: Eighth person in critical condition in Brisbane hospital". ABC News. Australian Broadcasting Corporation. Archived from the original on 13 June 2015. Retrieved 13 June 2015. ^ "Malaan National Park Management Statement 2013" (PDF). Department of National Parks, Recreation, Sport and Racing. Archived (PDF) from the original on 3 September 2014. Retrieved 28 August 2014. ^ Dungey, Kym; Whytlaw, Jane (2007). Tropical walking tracks of North Queensland. Kuranda, Qld. : Footloose Publications. pp. 84–146. ISBN 9781876617141. ^ "Ravenshoe Railway Company". Ravenshoe Railway Company Ltd. Archived from the original on 14 June 2015. Retrieved 12 June 2015. ^ "Ravenshoe State School". The State of Queensland (Department of Education and Training). Archived from the original on 9 March 2015. Retrieved 10 June 2015. ^ "St Teresa's Primary School". St Teresa's Primary School. Archived from the original on 11 June 2015. Retrieved 10 June 2015. ^ "C&K Ravenshoe Community Kindergarten". C&K. Archived from the original on 11 June 2015. Retrieved 10 June 2015. ^ "Ravenshoe Millstream Country Club". Archived from the original on 27 July 2018. Retrieved 30 May 2017. ^ "Ravenshoe Library". Public Libraries Connect. State Library of Queensland. 22 December 2015. Archived from the original on 29 January 2018. Retrieved 29 January 2018. Wikimedia Commons has media related to Ravenshoe, Queensland. This page was last edited on 18 April 2019, at 23:28 (UTC).